Well craft beer fans, another week is in the books, and there was a whole crop of interesting news. From Fat Head’s handing out hop plants to Ohio passing craft beer legislation that didn’t sit well with Anheuser-Busch InBev. Friday is the day when the Craft Brewing Business (CBB) crew kicks back with a craft beer and talks craft beer industry headlines. Let us know what craft beer headlines caught your attention this week and sound off on what beer you’re excited to enjoy this weekend in the comments below. One word: Pouches. In Connecticut, lawmakers are considering a bill that allows beer and malt beverages to be sold in pouches. We reported on this yesterday and I still can’t get over it. POUCHES! Like a Carpi Sun! What would craft beer be like in pouches? Would I struggle to open it with that flimsy straw and spill it all over myself? What is the pouch beer benefit? I foresee a future CBB packaging feature story. Pouches! One word: Pouches. Just kidding. One word: Cans. Feels like this is this is the unofficial year of the can with a plethora of prominent breweries deciding to launch a new canned brand or repackage a staple and get it in more places. That was a big factor in writing this feature on mobile canning. 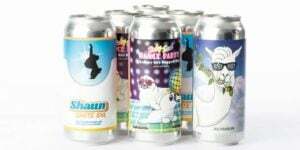 As the industry starts to implement aluminum packaging at a rapid pace, for a variety of reasons, today’s growing brewer needs to know about all of the tools and strategies that could help facilitate that growth or spur on a new idea within a reasonable budget. That’s a fancy way of saying here’s a story about a company that has trucks that will put beer in cans for you – might help. I like when a small business is versatile in how it markets and distributes its product. Breweries use retail stores and distributors because it allows them to reach the largest number of consumers. Shipments of beer through the mail might be another option for specific combinations of breweries and consumers. I can imagine a scenario where a brewery had a limited run of one of its less traditional beers. It would likely try to target a very specific demographic with that product and shipping it to a store shelf where there might or might not be demand could be risky. Allowing the consumer to be the one dictating where the beer was shipped (their home) could end up being a more effective distribution channel. The argument that this would lead to minors ordering beer online doesn’t seem to be any more likely of a scenario than minors using adults to buy them beer at the corner gas station – or using fake IDs or friendly store employees for that matter. Minors don’t want beer in two business days, they want it now! Adults purchasing a high end product who don’t also mind paying shipping charges are the ones who are going to use this method. It’s a neat idea and I’d like to see what breweries and consumers can do with it.